At the Council of BARI, St. Anselm defended against the errors of the Greeks, the doctrine that the HOLY SPIRIT Proceeds also from the SON, by countless proofs taken from the Scriptures and the Holy Fathers. Santa Maria Greca, pray for the Kingdom to Come through LUISA OF BARI, who is the reflection of the Holy Spirit on earth. “Blessed are you, Luisa, and all generations will call you Blessed. My Arm will make Works of Power in you. 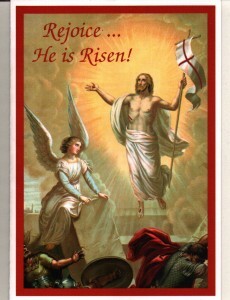 Resurrected Humanity of Jesus, symbol of those who will live in His Will. Resurrection. Therefore, they will be many; almost like stars, they will form a beautiful ornament to the Heaven of my Humanity. But the Saints of the living in my Will, who will symbolize my Resurrected Humanity, will be few. In fact, many throngs and crowds of people saw my Humanity, but few saw my Resurrected Humanity – only the believers, those who were most disposed, and, I could say, only those who contained the seed of my Will. In fact, if they did not have that seed, they would have lacked the necessary sight to be able to see my Resurrected and glorious Humanity, and therefore be spectators of my ascent into Heaven. How, if man had not sinned, Jesus was to come upon earth glorious and with the scepter of command. Man was to be the bearer of his Creator. … Listen my little newborn of my Divine Will (Luisa): if man had not sinned, if he had not withdrawn from my Divine Will, I would have come upon earth – but do you (Luisa) know how? Full of majesty, as when I rose again from death. Even though I had my Humanity similar to that of man, united to the Eternal Word, how different was my resurrected Humanity – glorified, clothed with light, not subject to either suffering or dying: I was the true Divine Triumpher. On the other hand, before dying, though voluntarily, my Humanity was subject to all pains; even more, I was the Man of Sorrows. And since man had his eyes still dazzled by the human will, and therefore he was still infirm, few were the ones who saw Me resurrected, and this served to confirm my Resurrection. Then I ascended into Heaven, to give man the time to take the remedies and the medicines, so that he might recover and dispose himself to know my Divine Will, in order to live, not of his will, but of Mine, and so I will be able to show Myself full of majesty and of glory in the midst of the children of my Kingdom. Therefore, the Resurrection is the confirmation of the Fiat Voluntas Tua on earth as It is in Heaven. After such a long sorrow, suffered by my Divine Will for many centuries, of not having Its Kingdom upon earth and Its absolute dominion, it was right that my Humanity place Its divine rights in safety, and realize Its original purpose and Mine, of forming Its Kingdom in the midst of creatures. She sees the Resurrection of Jesus. Jesus speaks about obedience. As my adorable Jesus continues to deprive me of His presence, I feel a bitterness, and as though a knife were stuck in my heart, which gives me such pain as to make me cry and scream like a child. Ah, truly, I seem to have become like a child who, when his mother departs from him even for just a little, cries and screams so much as to turn the whole house upside down, and there is no other remedy to make him stop crying than for him to see himself in the arms of his mother again. So I am – a true little girl in virtue, for if it were possible for me I would turn Heaven and earth upside down in order to find my highest and only Good, and only when I find myself in possession of Jesus, then do I calm down. Poor little girl that I am, I still feel the swaddling clothes of infancy that clasp me; I am unable to walk by myself, I am very weak, I do not have the capacity of the adults, who let themselves be guided by reason. So here is the highest necessity I have to be with Jesus; right or wrong, I don’t want to hear anything – what I want to hear is that I want Jesus. I hope that the Lord may want to forgive this poor little girl, who sometimes commits some excesses. After this, the light withdrew, Jesus disappeared, and I am left with such sorrow, seeing myself without Him again, that I feel as if I had a burning fever that makes me fidget and rave. Ah! Lord, give me the strength to bear with You in these delays, for I feel faint. 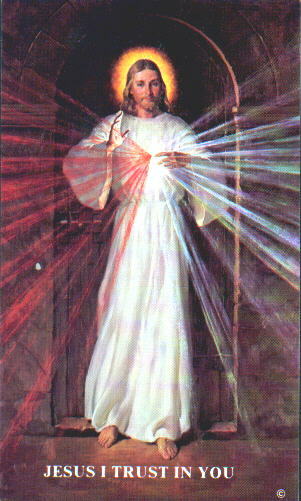 The garment of light of the risen Humanity of Jesus. This morning, finding myself outside of myself, for a little while I saw my adorable Jesus in the act of His Resurrection – all clothed with refulgent light, so much so, that the sun remained obscured before that light. I was enchanted, and I said: ‘Lord, if I am not worthy to touch your glorified Humanity, let me at least touch your garments.’ And He told me: “My beloved, what are You saying? After I rose again I had no more need for material garments; rather, my garments are of sun, of most pure light which covers my Humanity, and which will shine eternally, giving unspeakable joy to all the senses of the Blessed. This has been conceded to my Humanity because there was no part of It which was not covered with opprobrium, with pains, with wounds.” Having said this, He disappeared, and I could find neither His Humanity nor His garments; or rather, as I would take His sacred garments between my hands, they would escape me and I would not be able to find them. The Heaven of Jesus on earth is the souls who give a dwelling to His Divinity. As I was in my usual state, my adorable Jesus came for just a little and told me: “My daughter (Luisa), when I came upon earth my heaven was my Humanity, and just as in the heavens one can see the multitude of the stars, the sun, the moon, the planets, and vastness, all placed in good order; in the same way, my Humanity, which was my heaven – image of the heavens that exist up above, in which everything is orderly – was to make the order of the Divinity dwelling inside shine forth, that is, virtues, power, grace, wisdom, and the like. Now, when the heaven of my Humanity ascended into Heaven after my Resurrection, my heaven upon earth was to continue to exist – and it is the souls who give a dwelling to my Divinity. Dwelling in them, I form my heaven, and from them also do I make the order of the virtues contained inside shine forth. What honor for the creature to lend a heaven to her Creator! But – oh, how many deny it to Me! And you (Luisa) – would you (Luisa) not want to be my heaven? Tell Me you (Luisa) would.” And I: ‘Lord, I want nothing but to be recognized in your Blood, in your wounds, in your Humanity, in your virtues. In this alone I would want to be recognized, so as to be your heaven, and to be unrecognized by all.’ He seemed to approve of my proposal, and He disappeared. The three types of resurrection which suffering contains. As I continued to be in suffering a little more than usual, on coming, my good Jesus told me: “My daughter (Luisa), suffering contains three types of resurrection. First, suffering makes the soul rise again to grace. Second, as suffering advances, it gathers the virtues and the soul rises again to sanctity. Third, as suffering continues, it perfects the virtues, it embellishes them with splendor, forming a beautiful crown; and the soul, crowned, rises again to glory on earth, and to glory in Heaven.” Having said this, He disappeared. My pierced Mama, your little child, knowing that You are alone, without your beloved Good, Jesus, wants to cling to You to keep You company in your most bitter desolation. Without Jesus, all things change into sorrow for You. The memory of His harrowing pains, the sweet sound of His voice which still resounds in your ear, the charming gaze of dear Jesus, now sweet, now sad, now swollen with tears, but which always enraptured your maternal Heart – as You don’t have them with You any more, they are like sharp swords which pierce your maternal Heart through. Desolate Mama, your dear child wants to give You relief and compassion for each pain. Even more, I would like to be Jesus, to be able to give You all the love, the comforts, the reliefs and the compassion which Jesus Himself would havegiven You in your state of bitter desolation. Sweet Jesus gave me to You as your child; therefore, put me in His place in your maternal Heart, and I will be all for my Mama; I will dry your tears, and I will always keep You company. Dearest child, thank you for your company; but if you want your company to be sweet and dear to Me, and bearer of relief to my pierced Heart, I want to find in you the Divine Will operating and dominating, and that you do not surrender evenone breath of life to your will. Then will I exchange you with my Son Jesus, because, His Will being in you, in It I will feel Jesus in your heart. Oh, how happy I will be to find in you the first fruit of His pains and of His death! In finding my beloved Jesus in my child, my pains will change into joys, and my sorrows into conquests. Now, listen to Me, child of my sorrows. As my dear Son breathed His last, He descended into Limbo, triumpher and bearer of glory and happiness to that prison in which were all the Patriarchs and the Prophets, the first father Adam, dear Saint Joseph, my holy parents, and all those who had been saved by virtue of the foreseen merits of the future Redeemer. I was inseparable from my Son, and not even death could take Him away from Me. So, in the ardor of my sorrows I followed Him into Limbo, and was spectator of the feast and of the thanksgivings which that whole great crowd of people gave to my Son, who had suffered so much, and whose first step had been toward them, to beatify them and to bring them with Himself into celestial glory. So, as He died, conquests and glory began for Jesus and for all those who loved Him. This, dear child, is symbol of how, as the creature makes her will die through union with the Divine Will, conquests of divine order, glory and joy begin – even in the midst of the greatest sorrows. Even though the eyes of my soul followed my Son and I never lost sight of Him, at the same time, during those three daysin which He was buried, I felt such yearning to see Him risen, that in the ardor of my love I kept repeating: “Rise, myGlory! Rise, my Life!” My desires were ardent, my sighs, of fire – to the point of feeling consumed. With this act of triumph, He placed the seal on the fact that He was Man and God; and with His Resurrection, He confirmed the Gospel, His miracles, the life of the Sacraments, and the whole life of the Church. And not only this, but He obtained triumph over the human wills, weakened and almost extinguished to true good, to let triumph over them the life of that Divine Will which was to bring the fullness of Sanctity and of all goods to creatures. And at the same time, by virtue of His Resurrection, He sowed into the bodies the seed of resurrection to everlasting glory. My child, the Resurrection of my Son encloses everything, says everything, confirms everything, and is the most solemn act that He did for love of creatures. Now, listen to Me, my child; I want to speak to you as a Mother who loves her child very much. I want to tell you what it means to do the Divine Will and to live of It; and the example is given to you by my Son and by Me. Our life was strewn with pains, with poverty, with humiliations, to the point of seeing my beloved Son die of pains; but in all this ran the Divine Will. It was the life of our pains, and We felt triumphant and conquerors, to the extent of changing even death into ife; so much so, that in seeing Its great good, We voluntarily exposed ourselves to sufferings because, since the Divine Will was in Us, no one could impose himself on It, or on Us. Suffering was in our power, and We called upon it as nourishment and triumph of the Redemption, so as to be able to bring good to the entire world. “Sheep can get their head caught in briers and die trying to get untangled. 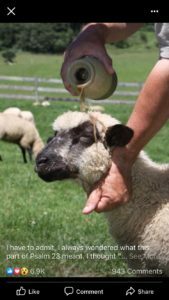 There are horrid little flies that like to torment sheep by laying eggs in their nostrils which turn into worms and drive the sheep to beat their head against a rock, sometimes to death. Their ears and eyes are also susceptible to tormenting insects. So the shepherd anoints their whole head with oil. That oil forms a barrier of protection against the evil that tries to destroy the sheep. Do you have times of mental torment? Do the worrisome thoughts invade your mind over and over? Do you beat your head against a wall trying to stop them? Have you ever asked God to anoint your head with oil? He has an endless supply! His oil protects and makes it possible for you to fix your heart, mind, and eyes on Him today and always! There is peace in the valley! May our good Father anoint your head with oil today so that your cup overflows with blessings! CCC: Q. 382. On what day did Christ die? CCC: Q. 383. Why do you call that day “good” on which Christ died so sorrowful a death? We call that day good on which Christ died because by His death He showed His great love for man, and purchased for him every blessing. My Crucified Good, I see You on the Cross, as on the Throne of your triumph, in the act of conquering everything and all hearts, and of drawing them so closely to You, that all may feel your superhuman power. Horrified at such a great crime, nature prostrates itself before You, and waits in silence for a word from You, to pay You honor and let your dominion be recognized. The sun, crying, withdraws its light, unable to sustain your sight, too sorrowful. Hell is terrified and waits in silence. Everything is silence. Your pierced Mama, your faithful ones, are all mute; and petrified at the sight of your torn and dislocated Humanity – alas, too painful, they are silently waiting for a word from You. Your very Humanity is silent, lying in a sea of pains, among the harrowing spasms of agony; so much so that they fear You are going to die at each breath! What more? Even the perfidious Jews and the ruthless executioners who, up to a little while ago, were offending You, mocking You, calling You impostor, criminal; even the thieves who were cursing You – everyone is silent, mute. Remorse invades them, and if they try to launch an insult against You, it dies on their lips. But as I penetrate into your interior, I see that love overflows; it suffocates You and You cannot contain it. And forced by your love that torments You more than the pains themselves, with strong and moving voice, You speak as the God You are; You raise your dying eyes to Heaven, and exclaim: “Father, forgive them, for they know not what they are doing!” And, again, You close Yourself in silence, immersed in unheard-of pains. 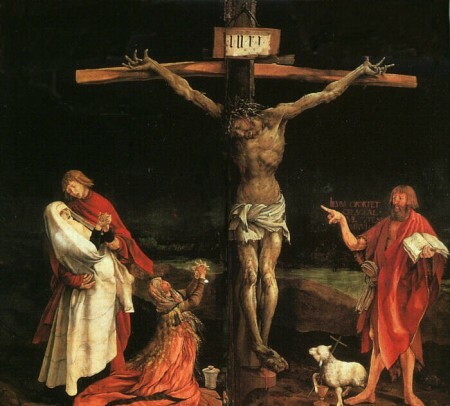 Crucified Jesus, how can so much love be possible? Ah, after so many pains and insults, your first word is of forgiveness; and You excuse us before the Father for so many sins! Ah, You make this word descend into each heart after sin, and You are the first to offer forgiveness. But how many reject it and do not accept it; your love is then taken by follies, because You anxiously desire to give your forgiveness and the kiss of peace to all! At this word, hell trembles and recognizes You as God; nature and everyone remain astonished; they recognize your Divinity, your inextinguishable love, and silently wait to see where it reaches. And not only your voice, but also your Blood and your wounds, cry out to every heart after sin: “Come into my arms, for I forgive you, and the seal of forgiveness is the price of my Blood.” O my lovable Jesus, repeat this word again to all the sinners which are in the world. Beseech mercy for all; apply the infinite merits of your most precious Blood for all. O good Jesus, continue to placate Divine Justice for all, and concede your grace to those who, finding themselves in the act of having to forgive, do not feel the strength to do it. My Jesus, adored Crucified, in these three hours of most bitter agony, You want to give fulfillment to everything; and while, silent, You remain on this Cross, I see that in your interior You want to satisfy the Father in everything. You thank Him for all, You satisfy Him for all, You beseech forgiveness for all, and for all You impetrate the grace that they may never again offend You. In order to impetrate this from the Father You go through all of your life, from the first instant of your conception, up to your last breath. My Jesus, endless love, let me go through all your life together with You, with the inconsolable Mama, with Saint John, and with the pious women. Let us go through the Life and the pains of Jesus. My sweet Jesus, I thank You for the many thorns that pierced your adorable head, for the drops of Blood shed by It, for the blows You received on It, and for the hair they tore from You. I thank You for all the good You have done and impetrated for all, for the enlightenments and the good inspirations You have given us, and for all the times You have forgiven all of our sins of thought, of pride, of conceit and of self-esteem. I ask your forgiveness in the name of all, O my Jesus, for all the times we have crowned You with thorns; for all the drops of Blood we made You shed from your most sacred Head; for all the times we have not corresponded to your inspirations. For the sake of all these pains suffered by You, I ask You, O Jesus, to impetrate for us the grace to never again commit sins of thought. I also intend to offer You everything You suffered in your most holy Head, in order to give You all the glory that the creatures would have given You, had they made good use of their intelligence. O my Jesus, I adore your Most Holy Eyes, and I thank You for all the tears and the Blood they have shed, for the cruel pricks of the thorns, for the insults, the derisions and the contempts You bore during all of your Passion. I ask your forgiveness for all those who use their sight to offend You and insult You, asking You, for the sake of the pains suffered in your most sacred eyes, to give us the grace that no one may ever again offend You with evil gazes. I also intend to offer You all that You Yourself suffered in your Most Holy Eyes, to give You all the glory that the creatures would have given You if their gazes were fixed only on Heaven, on the Divinity and on You, O my Jesus. I adore your Most Holy Ears; I thank You for all that You suffered while those wicked people on Calvary deafened them with shouts and mockeries. I ask your forgiveness in the name of all for all the evil discourses which are listened to, and I pray that the ears of all men may be opened to the eternal truths, to the voices of Grace, and that no one may offend You, ever again, with the sense of hearing. I also intend to offer You all that You suffered in your Most Holy Hearing, to give You all the glory that the creatures would have given You, had they made holy use of this organ. O Jesus, I thank You for everything, and in the name of all, I raise to You a hymn of eternal and infinite thanksgiving. O my Jesus, I intend to offer You everything You have suffered in your Most Holy Person, to give You all the glory that the creatures would have given You, had they conformed their lives to Yours. My Jesus, I kiss your left foot; I thank You for all the steps You took during your mortal life, and for all the times You tired your poor limbs, going in search of souls to lead to your Heart. Therefore, O my Jesus, I offer You all of my actions, steps and movements, with the intention of giving You reparation for everything and for everyone. I ask your forgiveness for those who do not operate with righteous intention; I unite my actions to yours in order to divinize them, and I offer them united to all the works You did with your Most Holy Humanity, to give You all the glory that the creatures would have given You, had they operated in a saintly way and with upright purposes. O my Jesus, I kiss your right foot, and I thank You for all You have suffered and do suffer for me, especially in this hour, in which You are hanging on the Cross. I thank You for the excruciating crafting that the nails are making in your wounds, which rip open more and more at the weight of your most sacred Body. I ask your forgiveness for all the rebellions and disobediences committed by the creatures, offering You the pains of your Most Holy Feet in reparation for these offenses, to give You all the glory that the creatures would have given You, had they been submitted to You in everything. O my Jesus, I kiss your most holy left hand; I thank You for all that You have suffered for me, for all the times You have placated the Divine Justice, satisfying for everything! I kiss your right hand, and I thank You for all the good You have done, and You do, for all. In a special way, I thank You for the works of Creation, of Redemption and of Sanctification. I ask your forgiveness in the name of all, for all the times we have been ungrateful at your benefits, for our many works done without upright intention. In reparation for all these offenses, I intend to give You all the perfection and sanctity of your works, to give You all the glory that the creatures would have given You, had they corresponded to all of these benefits. O my Jesus, I kiss your Most Sacred Heart, and I thank You for all You have suffered, desired and yearned for, for love of all and for each one in particular. I ask your forgiveness for the many evil desires, and for the affections and tendencies which are not good – forgiveness, O Jesus, for many who place your love after the love of creatures. And to give You all the glory that these have denied You, I offer You everything that your most adorable Heart has done and continues to do. Second word on the Cross. My pierced Love, while I pray with You, the enrapturing power of your love and of your pains keeps my gaze fixed on You. But my heart breaks in seeing You suffer so much. You agonize with love and with pain, and the flames that burn your Heart rise so high as to be in the act of reducing You to ashes. Your constrained love is stronger than death itself; and wanting to pour it out, looking at the thief on your right, You steal him from Hell. “Lord, remember me when You are in your Kingdom.” And You do not hesitate to answer: “Today you will be with Me in Paradise”; making of him the first triumph of your love. But I see that, in your love, You are not stealing the heart of that thief alone, but also that of many who are dying! Ah, You place your Blood, your love, your merits at their disposal, and You use all divine devices and stratagems in order to touch their hearts and steal them all for Yourself. But, also here, your love is hindered! How many rejections, how much lack of trust, how much desperation! And the pain is such that, again, it reduces You to silence! Third word on the Cross. Mother and Son – You understand each other, and You sigh with satisfaction and feel comforted in seeing that You can give your Mama to the creature; and considering the whole Mankind in John, with a voice so sweet as to move all hearts, You say: “Woman, behold your son”; and to John: “Behold your Mother.” Your voice descends into Her maternal Heart, and united to the voices of your Blood, it keeps saying: “My Mother, I entrust all of my children to You; feel for them all the love that You feel for Me. May all your maternal cares and tendernesses be for my children. You will save them all for Me.” Your Mama accepts. In the meantime, the pains are so intense that, again, they reduce You to silence. O my Jesus, I intend to repair for the offenses given to the Most Holy Virgin, for the blasphemies and the ingratitudes of many who do not want to recognize the benefits You have granted, by giving Her to us as Mother. How can we thank You for such a great benefit? O Jesus, we turn to your own source and we offer You your Blood, your wounds, the infinite love of your Heart! O Most Holy Virgin, how moved You are, in hearing the voice of good Jesus, leaving You to us as Mother! We thank You, O blessed Virgin, and in order to thank You as You deserve, we offer You the very thanksgivings of your Jesus. O sweet Mama, be our Mother, take care of us, and do not allow us to offend You even slightly. Keep us always clasped to Jesus; with your hands bind us – all of us, to Him, that we may not escape Him, ever again. With your own intentions, I intend to repair for all, for the offenses given to your Jesus and to You, my sweet Mama! O my Jesus, while You are immersed in so many pains, You plead even more the salvation of souls. But I will not remain indifferent; like a dove, I want to take flight onto your wounds, kissing them, soothing them, and diving into your Blood, to be able to say, with You: “Souls, souls!” I want to sustain your pierced and sorrowful Head, to repair and ask for mercy, love and forgiveness for all. Reign in my mind, O Jesus, and heal it by virtue of the thorns that pierce your Head; and do not allow any disturbance to enter into me. Majestic Forehead of my Jesus, I kiss you; draw all of my thoughts to contemplate You and to comprehend You. O Jesus, I extend my arms around your neck in order to embrace You; and You, extend Yours to embrace me. Please, O my Good, let this embrace of love be so tight, that no human strength may be able to unbind us. And while we are embraced like this, I will place my face upon your Heart, and then, with trust, I will kiss your lips, and You will give me your kiss of love. So You will make me breathe your most sweet breath, your love, your Will, your pains, and all of your Divine Life. Most Holy Shoulders of my Jesus, always strong and constant in suffering for love of me, give me the strength, the constancy and the heroism to suffer for love of Him. O my Jesus Crucified, I adore your most precious Blood; I kiss your wounds one by one, intending to lavish in them all my love, my adorations, my most heartfelt reparations. May your Blood be for all souls, light in darkness, comfort in sufferings, strength in weakness, forgiveness in guilt, help in temptations, defense in dangers, support in death, and wings to carry them all from this earth up to Heaven. O Jesus, I come to You, and in your Heart I form my nest and my home. O my sweet Love, I will call everyone to You from within your Heart; and if anyone wants to draw near to offend You, I will expose my breast, and I will not permit him to wound You; even more, I will enclose him in your Heart; I will speak about your love, and I will make the offenses turn into love. O Jesus, do not allow me ever to leave your Heart; feed me with your flames, and give me life with your life, that I may love You as You Yourself yearn to be loved. Fourth word on the Cross. Suffering Jesus, while I remain abandoned, clinging to your Heart and counting your pains, I see that a convulsive trembling invades your Most Holy Humanity. Your limbs are shaking, as if one wanted to detach from the other; and amid contortions, because of the atrocious spasms, You cry out loudly: “My God, my God, why have You abandoned Me?” At this cry, everyone trembles; the darkness becomes thicker; your Mama, petrified, turns pale and faints! My Love, how I grieve together with You! You are panting; your Most Holy Head drops on your breast – life is abandoning You. I also pray You, O my Jesus, for the sake of this extreme abandonment, to give help to so many loving souls, whom You seem to deprive of Yourself, leaving them in the dark, to have them as companions in your abandonment. O Jesus, may their pains be like prayers that call souls near to You, and relieve You in your pain. Fifth word on the Cross. “I thirst for your will, for your affections, for your desires, for your love. A water fresher and sweeter than your soul you could not give Me. O please, do not let Me burn. My thirst is ardent, such that I not only feel my tongue and my throat burn, to the point that I can no longer utter a word, but I also feel my Heart and bowels wither. Have pity on my thirst – have pity!” And as though delirious from the great thirst, You abandon Yourself to the Will of the Father. Ah, my heart can no longer live in seeing the evil of your enemies who, instead of water, give You gall and vinegar; and You do not refuse them! Ah, I understand – it is the gall of the many sins, it is the vinegar of our untamed passions that they want to give You, which, instead of refreshing You, burn You even more. O my Jesus, here is my heart, my thoughts, my affections – here is all of my being, to quench your thirst and give a relief to your mouth, dried and embittered. Everything I have, everything I am – everything is for You, O my Jesus. Should my pains be necessary in order to save even one soul alone – here I am, I am ready to suffer everything. I offer myself wholly to You – do with me whatever You best please. Sixth word on the Cross. O my Jesus, You have now exhausted Yourself completely; You have nothing left – love has reached its end. And I – have I consumed myself completely in your love? What thanksgiving shall I not render to You? What shall my gratitude not be for You? O my Jesus, I intend to repair for all – repair for the lack of correspondence to your love, and console You for the offenses You receive from the creatures, while You are consuming Yourself with love on the Cross. Seventh word on the Cross. Meanwhile, O Jesus, I see that You open your dying eyes again, and You look around from the Cross, as though wanting to give the last good-bye to all. You look at your dying Mama, who no longer has motion or voice, so many are the pains She feels; and You say: “Good-bye Mama, I am leaving, but I will keep You in my Heart. You, take care of my children and yours.” You look at crying Magdalene, faithful John and your very enemies, and with your gazes You say to them: “I forgive you; I give you the kiss of peace.” Nothing escapes your gaze; You take leave of everyone and forgive everyone. Then, You gather all your strengths, and with a loud and thundering voice, You cry out: “Father, into your hands I commend my spirit”. And bowing your head, You breathe your last. My Jesus, at this cry all nature is shaken and cries over your death – the death of its Creator! The earth trembles strongly; and with its trembling, it seems to be crying and wanting to shake up souls to recognize You as true God. The veil of the Temple is torn, the dead are risen; the sun, which until now had cried over your pains, has withdrawn its light with horror. At this cry, your enemies fall on their knees, and beating their breasts, they say: “Truly He is the Son of God.” And your Mother, petrified and dying, suffers pains harder than death. “Father, into your hands I commend my spirit and all souls.” My Jesus, I too abandon myself in You; give me the grace to die completely in your love – in your Will, and I pray that You never permit me, either in life or in death, to go out of your Most Holy Will. Meanwhile I intend to repair for all those who do not abandon themselves perfectly to your Most Holy Will, therefore losing or maiming the precious gift of your Redemption. What is not the sorrow of your Heart, O my Jesus, in seeing so many creatures escaping from your arms and abandoning themselves to themselves? Have pity on all, O my Jesus – have pity on me. O my Jesus, I kiss your Most Sacred Mouth, dry and embittered. I ask your forgiveness for all the times I have offended You with my evil discourses; for all the times I have contributed to embittering You and increasing your thirst. O Jesus, I kiss your Most Sacred Heart, and I intend to enclose in It, with my soul, all the souls redeemed by You, so that all may be saved – no one excluded. ‘The Kingdom of The Divine Will in the midst of creatures. Book of Heaven. The lamp of Grace. All the pains that Jesus suffered in His Passion were triple. 4/19 Divine Mercy Sunday is April 28th! The Novena for Divine Mercy Starts TODAY!